The Film Fund and Music Performance Trust Fund (MPTF) are teaming up with organizations in the US and Canada to bring live music to older adults at senior centers this year. Named MusicianFest, the program will stage up to 500 free performances at senior centers in an effort to bring the positive impact of music into the lives of older adults. The concert series also will boost the employment of local musicians—many of whom will be contemporaries of their audiences. In the US, MPTF is collaborating with the National Council on Aging (NCOA), and in Canada, they’ve teamed up with the Health Arts Society of Canada. CEO of University Settlement Michael Zisser, and AFM Secretary-Treasure Sam Folio. The inaugural US MusicianFest event was held at the University Settlement Neighborhood Center. 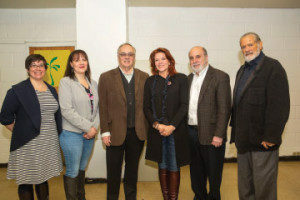 Grammy award winning singer-songwriter Rosanne Cash of Local 802 (New York City) introduced the first MusicianFest performer and spoke about the MPTF and the many benefits of music in her life. “For me, music is the greatest healing force in my life. When I want to sort out my memories, when I want to cry, I find a good, sad piece of music to do that. When I want to remember old times, when I want to connect with people I love, and the feeling I had when I fell in love or when I lost someone, or when I went on a journey. Music is the currency and the language for all of that, and it always has been for me. I’ve made sense of my life through music,” says Cash. To find a list of US senior centers hosting MusicianFest performances, visit www.ncoa.org/MusicianFest. In Canada, MusicianFest events will be held in conjunction with The Health Arts Society. Founded by David Lemon in Vancouver, British Columbia, in 2006, this organization meets the broadly understood need for high quality live professional arts programs for elders and others living in long-term residential care and retirement homes. Combined with its sister societies in every province, it’s the largest arts presenter to people in these facilities, bringing the work of some of the nation’s finest performers to people who can no longer enjoy regular public performances. To date, the society has presented more than 10,000 Concerts in Care to more than 450,000 people and provided professional musicians with 20,000-plus paid performance engagements. Health Arts Society, as well as sister societies Health Arts Society of Ontario and Québec’s Société pour les Arts en Milieux de Santé, are proud to be associated with MusicianFest, which draws attention to the valuable work of professional musicians in the communities of retirement homes and residential care. By contributing 75 Concerts in Care in Ontario, British Columbia, and Québec, the National Council on Aging and the MPTF bring the enrichment and pleasure of first-class music performance to people who cannot access public venues. The 75 concerts presented in Canada by the three societies will reach an audience of more than 3,000 with performances of classical, jazz, folk, and world music. Both the US and Canadian MusicianFest concerts are already engaged with a target completion date of June 30. For further Information about MusicianFest please contact MPTF Trustee Dan Beck: dbeck@musicpf.org.